After a tiring work week, James and I went on a last minute trip to Mesquite for The Lights Fest. 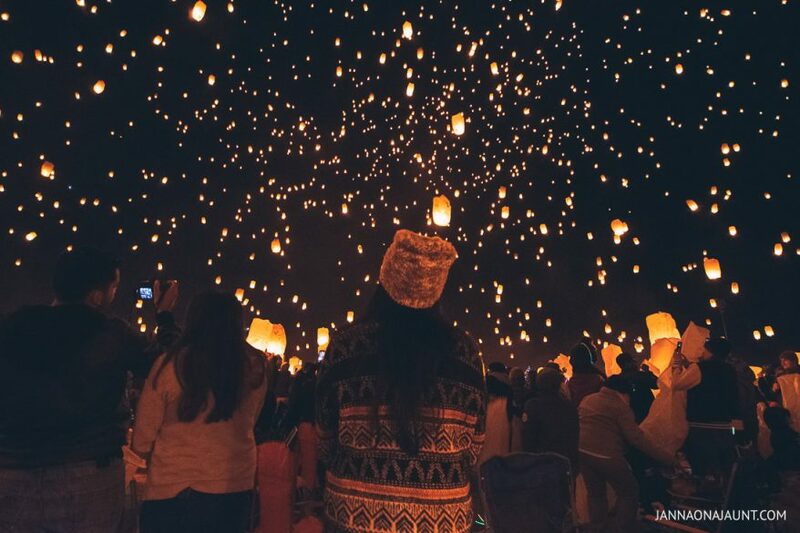 It’s the lesser known counterpart to Rise Festival, another lantern festival that takes place in Las Vegas. I’ve always wanted to go to Rise but the ticket prices have deterred me from attending. $129 for a regular ticket + $29 parking pass or $39 shuttle pass? It’s a bit steep if you ask me. What I like about The Lights Fest is their reasonable ticket prices. If you buy your ticket early, you can get it for as low as $25. We purchased our tickets last minute (5 hours before the event) and got ours for only $55 each. Not bad right? The Lights Fest? What’s that? Although they are a for-profit organization, they also partner with non-profits and charities in every community they visit. They selected the Make-A-Wish Southern Nevada as their charity of choice that day. 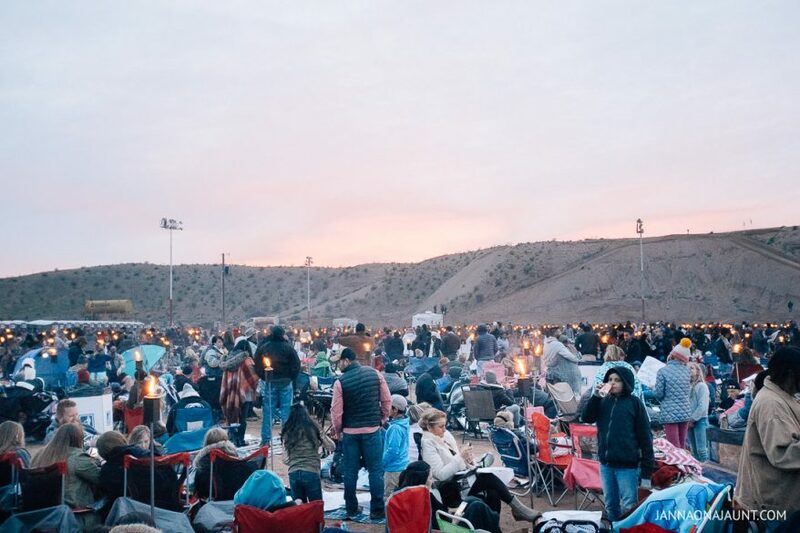 Food and Drinks (Alcohol not permitted) – Although there are food trucks inside the venue, I recommend bringing your own food and drinks. Their website says otherwise but I saw a lot of families who brought their own coolers inside the venue. Plus the lines were so long and from what I overheard, it took 1 hour for the orders to be taken and another hour or two to get the food. Either that or you can just eat beforehand. Collapsible Chairs – Get comfortable. You’ll be spending a few hours waiting for the lantern launch. Blankets and warm clothing– Stay warm! It gets pretty chilly at night. 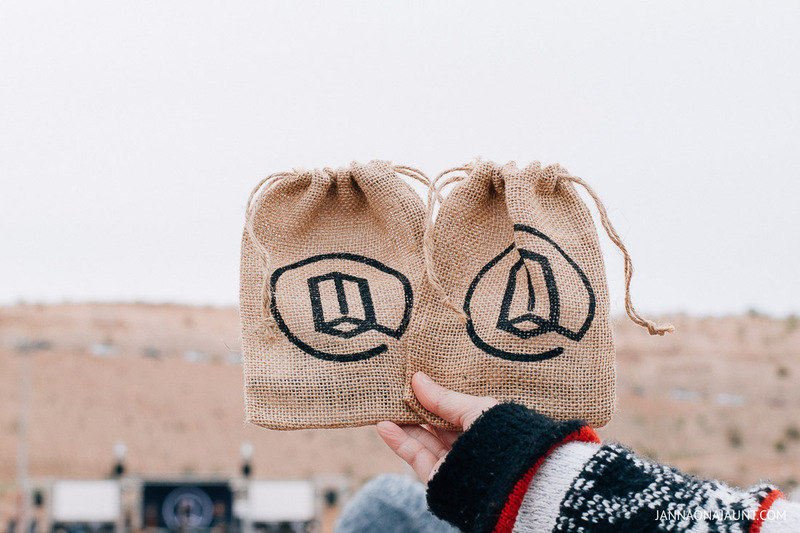 Stuff to keep you busy – There’s some live music and entertainment but we brought some playing cards just to help pass the time. 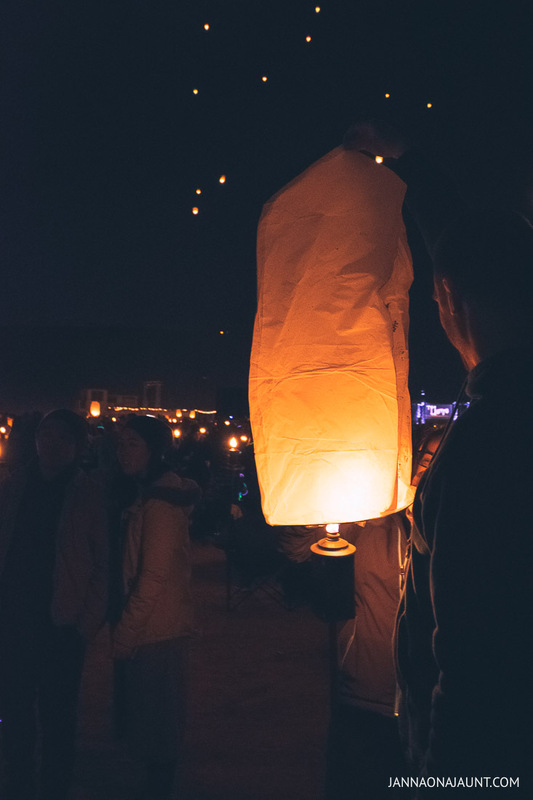 Camera – To capture that once in a lifetime moment when hundreds of lanterns light up the sky. From Las Vegas, it took us about 1 hour and 30 minutes to get to the location. I like that they had parking available inside the venue. It did take some time to get in and out of the parking lot but overall, it wasn’t too bad. It was actually somewhat organized. 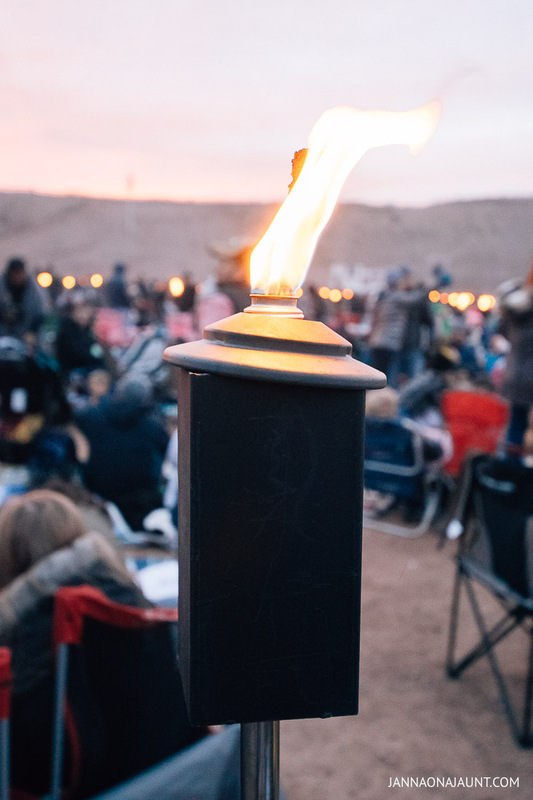 We made our way to the check-in tents where they gave us each a lantern and a swag bag (containing a marker, sticker and keychain flashlight) and instructed us to find a spot near any tiki torch on the field. Since it’s first come first serve, we only managed to snag a spot towards the back of the field. It wasn’t too bad though. I just wish they had set up more tiki torches for everyone. Hold your lantern above the torch. Light the ends of the block that’s at the bottom of your lantern. Ask someone to help you out. Its better with 2-3 people. Keep the lantern above the torch for 2-3 minutes. Have the other person hold the top of the lantern while you hold the bottom to prevent it from burning. 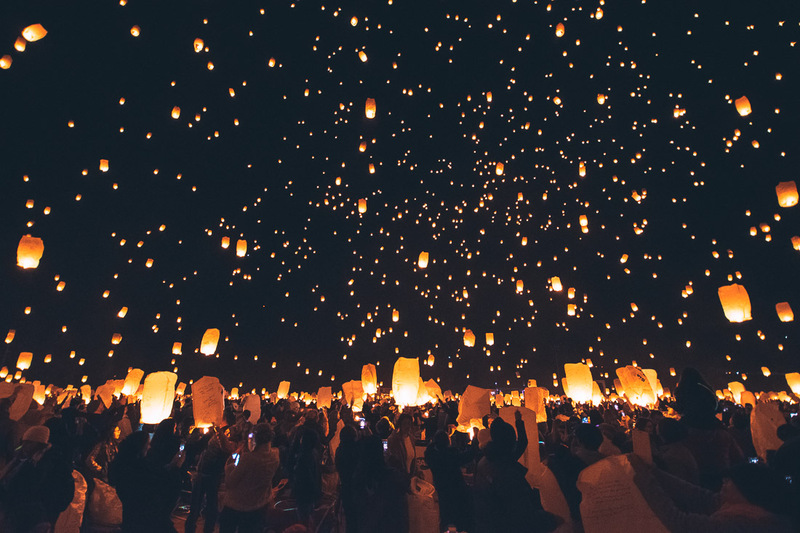 Release the lantern, take photos and enjoy! To be honest, I didn’t know what to expect. I thought it was just one of those random events where you can have unique photo ops. But I was wrong. 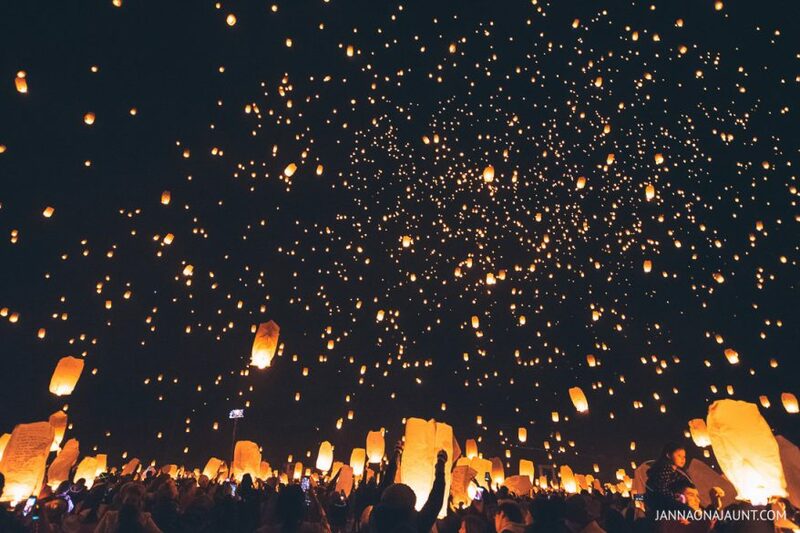 That surreal moment when hundreds of lanterns lit up the sky made me teary eyed. I can’t really explain the feeling. You guys just have to see it for yourself because it’s a view worth seeing in person. 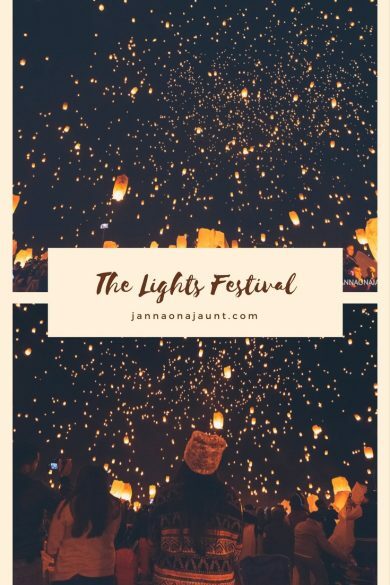 Have you been to a lights festival? How was your experience? Let me know in the comment section below. If you enjoyed this post, feel free to share it to your friends! Don’t forget to follow me on Facebook and Instagram for more travel inspiration! ? Yea, even I was surprised! Its a wonderful experience, definitely. You have to check it out on your next visit to Vegas. What a fun festival. That night time lighting ceremony looks really beautiful. Although- I would worry about catching my hair on fire. I have been to Las Vegas many times for weddings and to visit family, but I never heard about the Light’s Fest before. I totally want to check it out in the future. If it’s family friendly, I’ll bring my little nephews who live in Henderson. I bet they would love it too. I love these light festivals, we experienced one in Thailand not as big as this one but it was super fun. I was amazed at how high the lanterns went and how far they can travel. 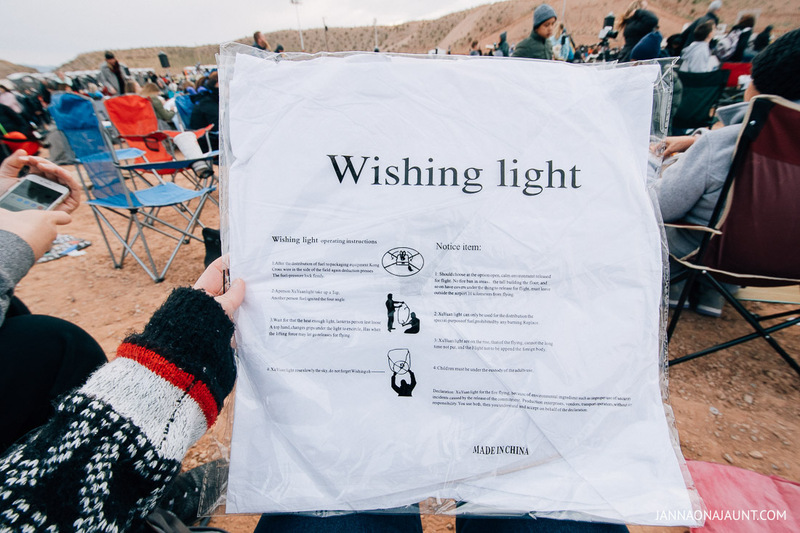 I would highly recommend attending a light festival, having music and raising a little money for Make a Wish sounds ideal. Its definitely a fun festival to attend. The one in Thailand is the original one right? And yes, its a plus that they were able to raise money for the Make a Wish foundation. It reminds me of the lantern festival I attended in Taiwan. It was a free entrance but the lights were lesser. I enjoyed it nevertheless. Oh how fun! I didnt know they have a lantern festival in Taiwan. Wow i never realise that they had one of those light festival in Vegas. Only ever heard of the ones in Thailand and Taiwan. Sounds like so much fun. Those lights just look so beautiful at night. Going to one of those is definitely in the bucket list. Thanks for sharing. Yeah I think that’s where they got the inspiration from. It was a wonderful experience! It was certainly a beautiful sight to see. Hope you get to experience it someday! Looks like something well worth witnessing for sure. 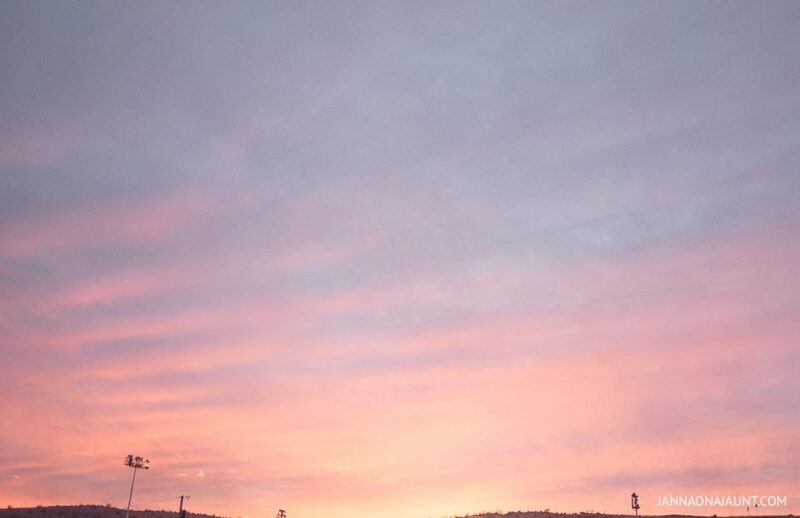 The lights seem to dance across the sky. Great event for all, my kids would love this sort of thing for sure. Seems reasonably prices aswell which is a bonus. That’s so cool. I was in Nepal during the 5 days Lights Festival but it was so different. Now I have to write a post about it and reading your post is such a fine add-on at my research. I think it’s a magic experience to see all those lamps/lampions. Oh they have one in Nepal too? I’d love to read about your experience there! When I saw the first photo , I thought this was about Lantern festivvals in Korea or so. Never knew something like this happens in the US. Truly breathtaking and the photos bring the contrast between daytime and night quite nicely. I know right? Its not something I thought they had here too. Thanks for liking the photos Nisha! I would love to have this experience. However, when I hear about lantern festivals I normally think about somewhere in Asia. I guess it’s pretty cool that they have it in Las Vegas as well. I hate long lines so most definitely I would walk with refreshments or maybe have something to eat on the way there. Right? Everyone thought so too! Yeah, we ate beforehand and brought snacks so we didnt have to fall in line for food. I had no idea this was something that happened here in the USA. 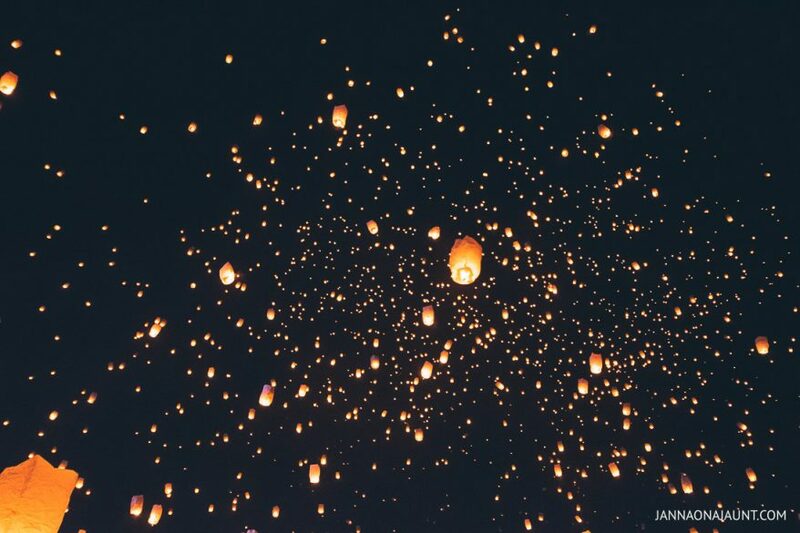 I went to the lantern festival in Chiang Mai this past year and it was incredible. It actually looks like Rise had more lanterns though, or at least more of a concentration in one spot, though that may be due to the scaled down events in Thailand after the Kings death. I would love to check out this festival, and I LOVE LOVE the leave no trace policy. Yeah, I think Rise has more lanterns coz its more popular. I didnt really know about this event till 1 day before the event. I hope you get to experience the one here in Vegas nxt year! Yeah its really expensive. Thats why Ive never really gone to a Rise festival because of their ridiculous prices. Thanks for liking the photos! I’ve never been to a lights festival. I don’t drive so it’s hard for me to get to out of the way places. But I love your amazing photos! If I could figure out how to get there, I would definitely want to go. Thanks so much Stella for liking the photos! Maybe you can go with someone…a friend who’s willing to drive and see the lantern festival? It’s something that you should definitely see at least once! Sounds like a really memorable event! Your photos look beautiful. I wonder if it’s available on the East Coast. One of the things I appreciated is that the lanterns are biodegradable and the limited flame time, that’s a big plus for the environment. That’s something I’d really like to experience. I almost went to the one in Thailand last year, but it didn’t materialise. The pictures are just fantastic! Thank you Pedro for liking the photos. That’s the one I originally wanted to go to but thank God they finally have it here in the US! That looks magical! Must’ve been so surreal seeing it in person! Hey Jenny! Sorry didn’t see this right away. But I used a kit lens and a wide angle lens. Hope you were able to get some nice shots! Thanks for sharing this! Real talk: if I wanna go just to watch, is that possible? 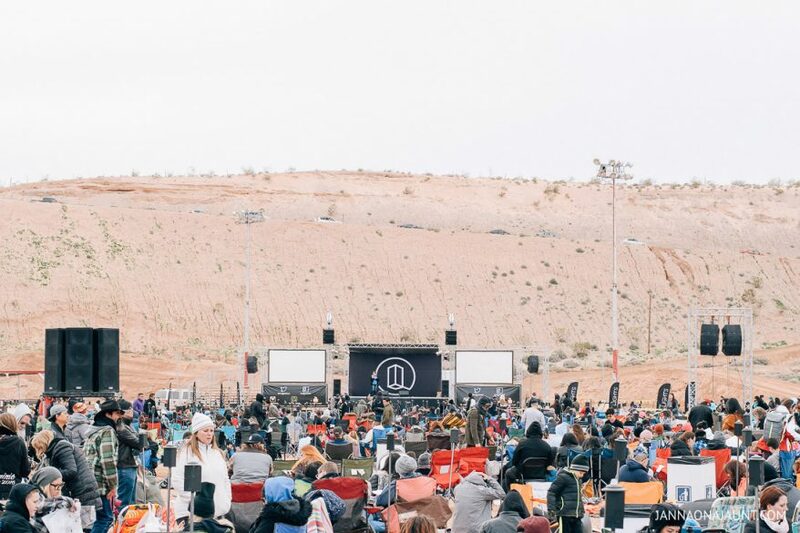 I know they choose locations that are outside of city limits, so I’m guessing there’s lots of space to watch even from a distance? I can’t swing the $50, but would love to see all those lanterns flying! Sorry for the late response. I’m sure you can see the lanterns from afar if you are around the launch area. I saw some people just parked outside the event and were able to see them from afar so maybe you can try and do that? I’m attending the one for tomorrow night. Any tips on what to bring for food? I’m excited because it’s one of my bucket list! ? 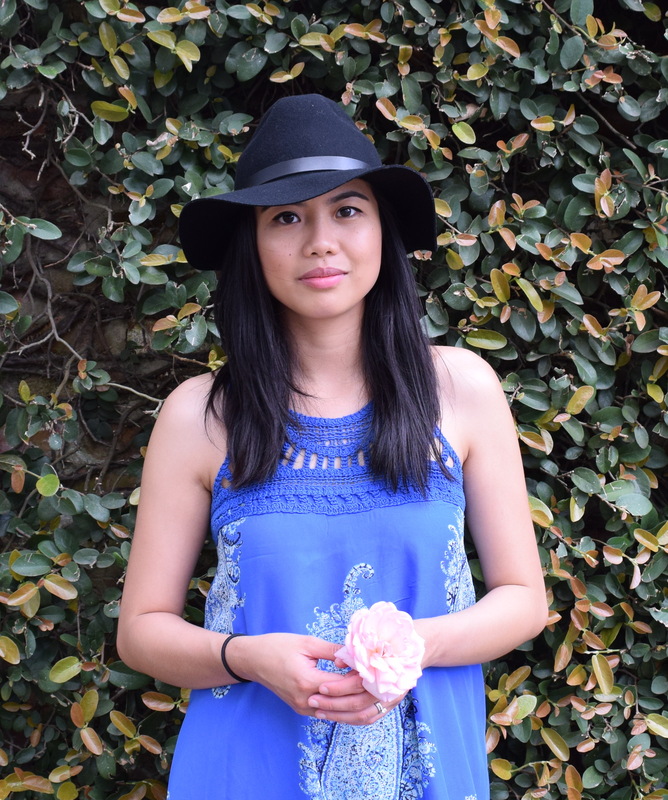 Hi Cyrene, sorry didn’t get to reply before the event but I hope you had an amazing time! Would it be possible to show up without a ticket if you just want to watch and don’t want/need a kit? Hi Michael, that I’m not sure. I think you may have to purchase ticket to gain entry inside the event. If you want to watch, maybe you can do so outside the venue. Heading to the Altanta event in a couple days. Excited! 1. What time do things wrap up? 2. I am sure that every city is different, but how long do you think it takes to get out of the parking lot (trying to figure out if we need a hotel room or if we can drive a couple of hours home)? Hi Amod! It ends around 8:30-9 pm if I remember correctly. and it took forever to get out of the parking lot to the freeway coz it was only one way. so just be ready for lotssss of traffic.